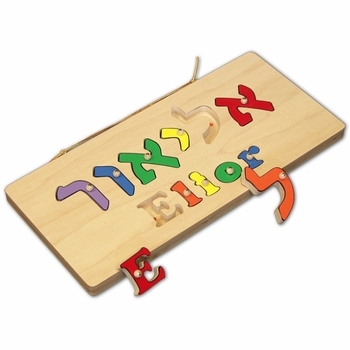 This unique Jewish baby toy is a cute puzzle board to help them learn their English and Hebrew names! It is proudly made in the U.S.A. from durable 3/4 inch Maple plywood and comes with a leather strap for hanging. Color dots matching each letter are placed on the inside of the puzzle board to give child clues matching the letter color to its correct position on the board. Each letter comes with a small wooden knob for removing pieces thereby helping little one to learn how to grasp objects. NOTE: The letters will appear on the puzzle as entered in the Child's Name field. We will not reverse the letters. The example 13,1,10,25,2,3 is the puzzle pictured. Please separate each number in the child's name field with a comma. Engrave birth information or your personal message on bottom of puzzle for a special touch. Makes a great birthday gift or holiday gift as well.